I have two bridesmaid dresses in my closet that I've only worn once. 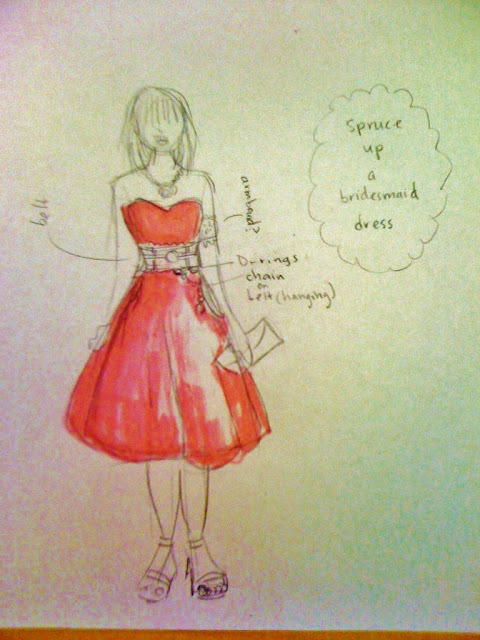 I have a wedding to go to next weekend so I was trying to think how I might add to my pink bridesmaid dress that I wore to my sister's wedding. I need to do something to it in order to make it look less like a bridesmaid dress. The question is, what makes a dress look like a bridesmaid dress? I started by making a sketch of my dress, then layered on accessories. I think the biggest way to change the dress would be to add a big belt. Maybe do something a little victorian/steampunk? Lace, chains, a dangling pendant? I'll be sure to post pictures if I do make this belt, or something similar based on this idea!